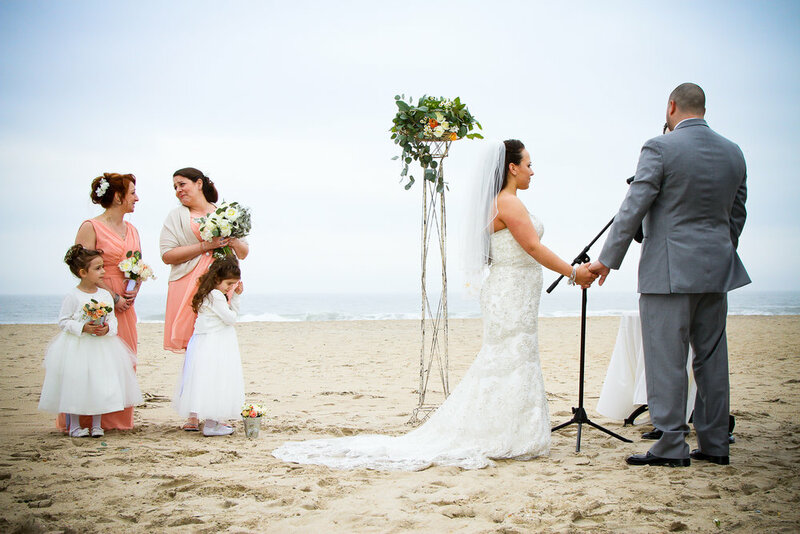 Today we are chatting with our January bride of the month, Michele DeFilippo. Michele and her husband Vinnie tied the knot at Tim McLoone’s Supper Club on the Jersey Shore in 2015. Their one-of-a-kind invitations were absolutely stunning with a nautical and vintage sea twist, featuring a weathered woodgrain enclosure and hand-drawn ocean creatures. That octopus is truly a showstopper! Michele tells all about her wedding day, theme and plenty of advice - read on and enjoy these gorgeous photos, captured by CBL Photography. Michele: Our wedding day was definitely the most magical day of my whole life. It took place at Tim McLoone’s Supper Club on the Asbury Park Boardwalk. That area was always very enchanting to me, a balanced mixture of old and modern styles. We wanted a vintage lounge feel and The Supper Club was the perfect place. We chose April 10, 2015 as the date, we didn’t want it to be too cold or too warm because we wanted to have it on the beach. The actual day of the wedding it was foggy, damp and windy. But, we had our hearts set on having a beach wedding and that’s what we did. I’ll never forget the sound of the seagulls, waves and wind, it was refreshing and a bit chilly but, so calming. We had violins playing before and during the processional and then after the ceremony. I had my brother as the officiant at the wedding much to the surprise of all my guests. Inside the venue we reserved an area for remembrance of family members who had passed. Every detail of our wedding was “US” in a nutshell. Michele: One favorite memory about that day was that our videographer got us to ride on a tandem bike. It was so much fun riding around in a suit and a wedding gown. I mean, I’m amazed we were able to ride it. We couldn’t remember the last time we road bikes.. and it was tandem so it was a lot harder! We probabley looked like fools but, it was perfect in the video. The speeches were priceless that day, we’ll never forget them. Our Cousin Jimmy wrote his whole speech on a white paper plate that was all folded up in his pocket, which made it funny when he unfolded it to read. The laughter started there and didn’t end. We were grateful that we had such a small wedding (75 people) because we were able to greet every single person. We didn’t miss any part of the wedding because of it. I think that made it most memorable. Michele: Vinnie and I had been together for 8 years prior to our marriage so, there was not too much change. But, we love the fact that there are surprises in what the future holds. The one thing that’s for certain is that we’re in it together and we can make it through anything. Uncertain certainty, I’d call it. That’s what we think the best thing about being married is. Michele: Nautical-Vintage-Lounge. We chose the theme based solely on our personalities. We are a very relaxed couple and we love the beach and shore living. 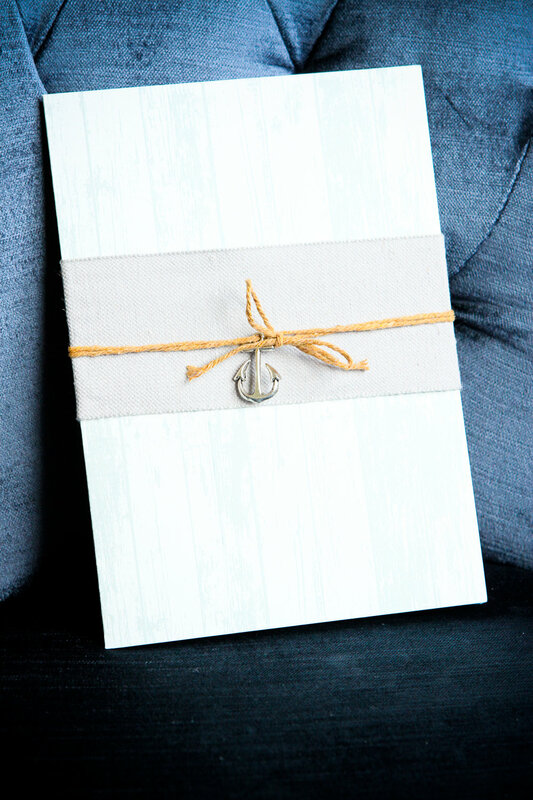 APS: How did you decide on the design of your nautical and vintage wedding invitations? Michele: It was very easy once I spoke to Lisa about the vibe and the location of the wedding. Details, like colors, were based off of what the bridal party was wearing. The groomsmen wore navy and the Bridesmaids wore peach. I had my grandparents in my thoughts, thinking of what they would have liked. The theme for our save the dates and shower invites led up to the creation of my wedding invitations. The end result is what dreams are made of and I received so many compliments from all of my guests. Michele: When Lisa showed me some nautical graphics, I saw the octopus and I was in love. It tied the whole theme together, it was the perfect feature. 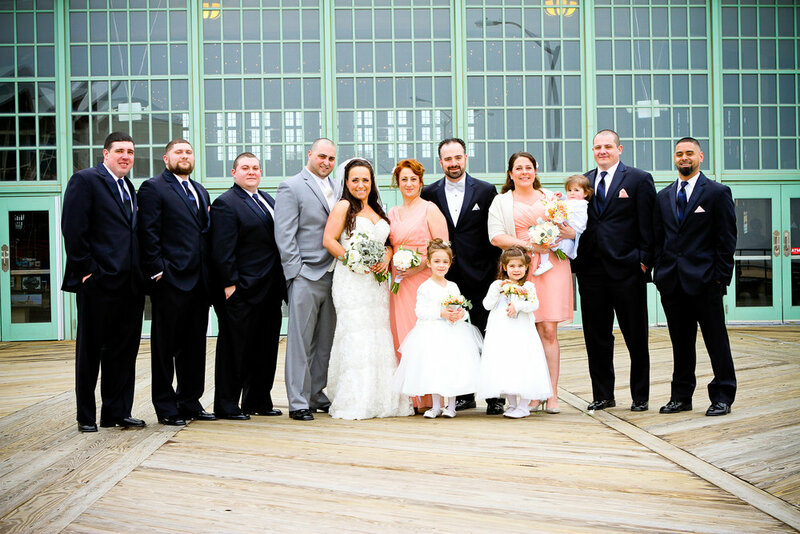 The whitewash wood was just another detail that fit perfect being that our wedding was taking place on the boardwalk. Michele: I would say just to make it reflect your vision. Simple elements here and there make the invitations more inviting. And last but not least, ALWAYS TRUST LISA. Give her a detailed description of what you’re looking for and she will guide you in the right direction. Thank you to Michele and Vinnie! We are so happy that you have enjoyed almost two years of wedded bliss and happiness. Congratulations!